This series recognizes the varied academic and professional English learning needs of college students as they prepare for different careers. By adopting the English for Specific Purposes (ESP) approach—one of the most effective EFL teaching methods used today—the series equips students with academic skills for English-speaking classrooms, while also providing relevant language training to ensure professional success. 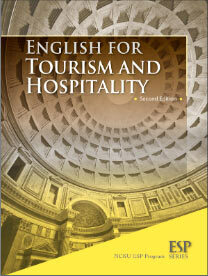 ESP: English for Tourism and Hospitality consists of four units focusing on travel agencies, hotels, the tourism industry in operation and dining. Use of any material on this website is strictly prohibited without the owner's prior permission. Copyright 2016 by LYNX PUBLISHING. All rights reserved.